Now Open! New showroom and office! Hello, and welcome to The Carpenter's Shop, your source for precision wood products. We are located in the heart of Pennsylvania hardwood country; surrounded by abundant timber stands considered by many to be among the best woods in the world. A glance at our work might suggest 18th century craftsmanship, however, a closer look will reveal 21st century precision. Our 10, 000 square-foot production and assembly facility, is equipped with some of the best woodworking machinery available. Even so, good tools are not all that is needed to create the wood products you demand. That's why our skilled employees have extensive experience in wood manufacturing. The Carpenter's Shop, Inc. never compromises quality, material, machinery, and / or personnel and we carefully select suppliers of hardwood and other materials.We purchase only FSC certified lumber (Forest Stewardship Council). The true beauty of our work is the combination of all the materials used to create a work of art. Many know us for specialty products such as custom hardwood doors, wainscoting, wood drop ceilings, custom cabinetry, architectural millwork, and stair cases and parts. 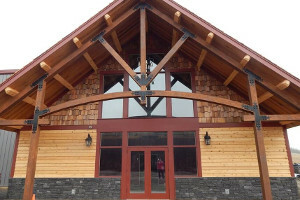 Because we are a custom woodworking shop, you are not limited to these products or designs. The scope of our work is extremely broad, making it impossible to list every product we are capable of creating. Therefore, please feel free to browse our website and take a look at our many photos albums to get an idea of the level of our craftsmanship. We look forward to getting to know you and/or your company better and are eager to build a strong business relationship with you. Please feel free to contact us with any questions or for pricing and ordering information.